The book of Ruth conceals the extraordinary within the mundane, everyday events it relays. It book begins with a famine in which the providers of Ruth and her female companions are not spared death. It moves on to tell of how one of Naomi’s daughters-in-law leaves Naomi to fend for herself. Finally, it goes on to detail how Ruth, Naomi’s other daughter-in-law, remains with Naomi, who has nothing to offer Ruth. Whereas the Israelites hungered in the wilderness and received manna from the hand of God, bread which literally fell from heaven, these women experience hunger, watch their husbands die, fight bitterness, and grapple with sorrow and anxiety about the future. If the author were attempting to construct a mythology of divine intervention, as some unbelievers claim, then why is this book given over to the mundane from its very onset? Why would a supernatural book, whose content centers around the person and work of a to-be-crucified Divine Rabbi, not be given over wholly to the explicitly miraculous and the explicitly prophetic? In a word, it is because God is not a pagan deity. Contrary to the misreadings of unbelievers, God does not intervene in our world: He does all things according to the counsel of his own will. The mundanity of the book of Ruth underscores the Sovereign hand of God over history and all of its ongoings. For although it was written in the time of the Judges, a time of political anarchy and spiritual apostasy, the book of Ruth demonstrates that God has preserved for himself a people, those who would worship him according to his dictates, and walk in faith concerning the coming Seed of the Woman/the Messiah. God’s Sovereign orchestration of the most mundane of affairs (e.g. 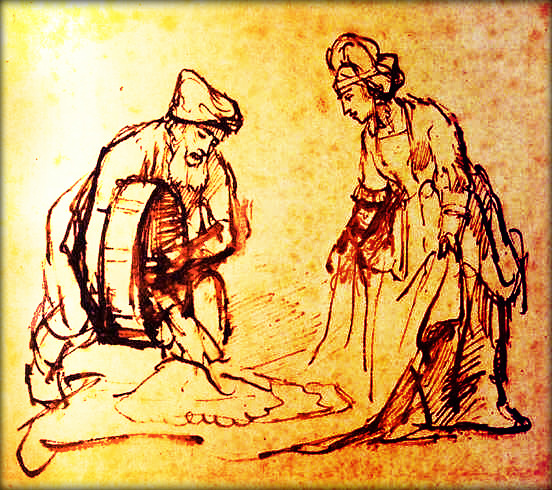 gathering grain, asking a man’s hand in marriage, complaining about one’s bad lot in life) is clearly displayed in the book of Ruth, showing us that God’s control over all things is not interventionist, observable only in the miraculous events of, for instance, the Exodus or the resurrection of Christ. The mundane events in Ruth are an immediate corrective to the unbeliever who identifies the whole of Scripture as teeming to the brim with explicitly miraculous acts of God which parallel those of the ancient and modern pagan deities. Yet once we have reverently underscored the mundanity of the events recorded in the book Ruth, and once we have shown that the events’ mundanity strongly demonstrate that God’s Sovereign control is over all of history, even its minutest of details, we can go one step further and show that the book, despite its mundanity, is itself evidence of its supernatural origin. For the main characters and events constituting the book of Ruth typologically foreshadow the non-mundane characters and events constituting the reality of the Gospel we find clearly articulated in the New Testament. Naomi and Ruth, Jew and Gentile, are redeemed at their most desperate moment by a righteous, strong, wealthy, and self-sacrificing son of Abraham named Boaz. The book’s central events are (1. )a famine of bread, (2. )redemption, (3. )marriage, and (4. )the establishment of a restored Israel comprised of Jews and Gentiles. In what follows, it will shown that Boaz is a type of Christ is many significant ways. This demonstration will further reveal the unity of the Scriptures in their emphasis on the person and work of Christ. Though the providence of God can be examined to great spiritual benefit, this article will only delve into Boaz’s typological function in the book of Ruth. It will be shown that the book is not merely about the preservation of the lineage through which Christ would come, it is also about the One through whom this lineage would come - the Lord Jesus Christ. For instance, the Lord commanded Israel to “…not reap [their] field right up to its edge, [nor] gather the gleanings after [their] harvest,” and Boaz obeys this command by also giving her opportunity to glean and provide for her mother-in-law. Thus, the redeemer leaves gleanings for “the poor and for the sojourner,” viz. Ruth, providing her with protection, for the Lord had commanded all Israel to “love the sojourner…for [the Israelites] were sojourners in the land of Egypt.” Aware of her status as a widow, Boaz obeys God’s command to “not mistreat” Ruth. Additionally, Boaz does not immediately redeem Ruth. Rather, he seeks to obey the Law of God by legitimately becoming the next kinsman redeemer. Boaz fulfilled all righteousness, becoming Ruth’s husband not by underhandedly avoiding the nearer kinsman redeemer than himself but by putting the nearer kinsman redeemer to the test. The nearer redeemer’s unwillingness to perpetuate the name of Mahlon, it must be noted, is also to be seen in contrast to Boaz’s willingness to so do, as it underscores Boaz’s righteousness according to the Law of God. The nearer kinsman redeemer sees the role of redeemer as something that will “impair [his] own inheritance.” Boaz, in contradiction to the nearer redeemer, finds joy in being the redeemer. 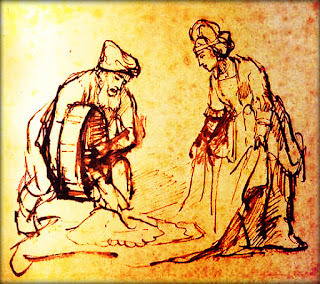 As noted above, it is not until after Boaz fulfills all righteousness demanded of him by the Law that he and Ruth marry, become one flesh, and produce Israelites in a manner like “Rachel and Leah, who together built up the house of Israel.” Though the house of Israel is a spiritual wasteland “in the days when the judges ruled,” Boaz the redeemer takes it upon himself to redeem Ruth through his fulfillment of the Levirate law. It must also be noted that Boaz is likewise Naomi’s “redeemer,” giving Naomi not simply a male heir but, indeed, “a restorer of life.” Boaz is the redeemer of the Gentile Ruth, as well as the Jew Naomi. Implicit to the notion of kinsman redeemer is Boaz’s role as provider for Ruth. Like Abraham, Ruth “left [her] father and mother and [her] native land and came to a people that [she] did not know before.” Similarly, as the Lord’s “wings” provided “refuge” for Ruth, Boaz’s “wings” would soon be sought for redemption. And as the Lord provided Abraham with a land rich with milk and honey, so too Boaz provides for Ruth a wealthy home where servants reap their master’s harvest, surveil what is happening in their master’s land, and report these affairs to their master faithfully. Although she was living with Naomi, and although she was seemingly considered a Jew at least in principle for her having joined herself to Naomi and the people of God, she only truly became an Israelite by her union - legally and relationally - to the redeemer, Boaz. The book of Ruth is an historical record of how the great grandparents of the Lord Jesus Christ were brought together providentially by Yahweh. It is a reminder to Israel that God’s promised Seed, the Seed of Woman, would come to men, Jew and Gentile, and crush the head of the serpent. It is an encouragement to God’s people to wait for the promised Seed. However, it is also a staggeringly detailed narratival portrait of how the promised Seed would save man. The promised Seed would be a man from Bethlehem, who would redeem Jew and Gentile through his obedience to the law of God. Jews would be given “restored life” through his work of redemption, and Gentiles would be grafted into the Israel of God by their marriage to him. The Seed would be a man in whom is strength, but a man whose righteousness is exhibited in his humility and refusal to abuse his strength. The Seed would be a man who was wealthy, but who would undergo the loss of his wealth willingly for the sake of redeeming his bride. The Seed would be man whose moral character would stand out among his peers. He would be a man whose acts of provision, protection, and kindness mirror those of God. The Seed of the woman would establish a renewed Israel, and inaugurate the kingdom established by God. Do Boaz’ attributes point us to the divinity of the Lord Jesus Christ? Yes, for while Boaz’s righteousness imperfectly mirrored the righteousness of Yahweh, Jesus’ righteousness is the righteousness of Yahweh. Christ reflects the Father’s glory perfectly. As Paul says, “he is the image of the invisible God, the firstborn of all creation,” “in whom we have redemption, the forgiveness of sins.” Likewise, whereas Boaz owned a portion of land, throughout which he sent his reapers to harvest crops, Christ owns all things and will send out his angelic reapers at the time of the great harvest to gather the elect from the four ends of the earth. Whereas Boaz’s ability to reproduce after his own kind is purely biological, Christ’s descendants are produced supernaturally by the Word of God and his Holy Spirit. In a word, what was superlatively present in Boaz’s person and work is present in Christ in a distinctly superior and literal manner. Ruth 2:11; cf. Gen 12:1-3. The promise of the Gospel is given prior to the establishment of the nation of Israel, i.e. in Genesis 3:15, and, therefore, is not solely concerned with the Jews but all ethnic groups. cf. Rom 11:22-24 & 1st Pet 2:9-10. This is seemingly implied by the words of the next nearest kinsman in Ruth 4:6.
 cf. 1st Pet 2:21-23 & John 8:46.
 cf. Mark 1:15 & Matt 13:31-32. n.b. : Boaz’s inauguration of the kingdom established by God is hinted at by his fathering Obed, the father of Jesse, the father of king David. Boaz’s role as the progenitor of king David, albeit removed by a short span of time, links the Pentateuch and Joshua to the historical books which center around (i. )the coming of king David, (ii. )the establishment of David’s lineage, (iii. )the dissolution of the Davidic dynasty, and (iv. )the expected David king (as prophesied in the Major and Minor Prophets, though, indeed, the scope of their writings extends beyond the restored kingdom of David). cf. Matt 13:24-30 & Matt 24:31.
 cf. James 1:18 & 1st Pet 1:23.
 cf. John 3:6-8; 1st Cor 15:45; Titus 3:5.